One of the great promises of the Internet — a democratic, transparent, open network that would disintermediate entrenched industries, remove fee-taking middlemen and thereby lower the costs of goods — has seemingly been realized. Priceline and Expedia mostly killed travel agents; Prosper and Avant are fast disrupting bank loan officers; and the car salesman has been diminished in favor of eBay, Autotrader and Craigslist. And yet, just as surely as we thought they were gone for good, middlemen have come surging back to life — rebranded as our best friends: the personal concierge. Case in point, personal shoppers were once a luxury — a sign of elite class and prestige. No longer: Hundreds of thousands of consumers are now communicating with personal stylists (or data-driven human/artificial intelligence hybrids) via next-gen fashion platforms such as Trunk Club and Stitch Fix — two platforms with demonstrative value (Trunk Club was acquired more than a year ago for $450 million, and few experts would reject Stitch Fix’s $300 million recent valuation). And while fashion is an obvious use case, the concierge economy is thriving, spanning verticals from wellness to design, with a whole host of broad-based horizontal concierge services also trying to impress their worth. The logical question is: why? Given all the advantages of a frictionless, democratic playing field, why are concierge services suddenly surging in popularity? I see three likely explanations: Amazon, too many SKUs and customer acquisition. Amazon. If you sell practically any physical good online, Amazon, the Internet’s most powerful retailer, is a perpetual threat. With their distribution, leverage and logistics expertise, they have the wherewithal to undercut on price, and process and deliver products faster than practically any startup — not to mention, they can operate at a loss if necessary. So where is Amazon exposed? On a services level. Amazon’s operating margins — already tight at 1.3 percent — don’t allow for much room to train and mobilize a large human concierge force. Which means that building a human-focused, relationship-driven personalization platform actually provides for a tangible differentiator against Amazon — one of the few ways to effectively compete against the giant (and, perhaps more importantly, one of the few ways to build defensibility in a commerce segment traditionally dependent on “brand” as its only de facto moat). One further point: Amazon is predominantly a destination for directed search – either on a specific product or specific category basis. But as purchasing increasingly shifts to mobile, it turns out that it continues to be difficult to search, discover and catalogue individual items. Concierges – especially when leveraged via a mobile interaction point – reduce that friction and enable a new purchasing behavior. Too Many SKUs. We exist in a world of overwhelm. That overwhelm via multi-tasking is affecting how we learn and think, and the overwhelm via optionality and availability of information is also affecting how we process, “shatter[ing] focus” and deferring decision making as long as possible. But based on the hyper-growth of concierge-facilitated platforms, it appears that curation doesn’t go far enough for the emerging set of millennial buyers — they demand even more assistance and personalization than before. The question operators and investors should be asking is not whether consumers are connecting with digital assistants, but rather, at what point will we actually acquire too many? Therein lies the threat of repeating the cycle of cognitive overwhelm and forcing the next iteration of the operator/customer relationship. Customer Acquisition. One of the curiosities of the concierge resurgence is that it may have opened the door for the next generation of customer acquisition. The middlemen — when incentivized via a pay-for-performance model — actually become de facto customer acquisition agents for the company, serving as outbound salespeople. Trunk Club was one of the innovators of this model and our portfolio company, LGS, has leveraged it with great success. The concierge model is formulated as an expert/amateur relationship. It replicates much of the power/incentives of a multi-level-marketing (MLM) model, without the pyramid-like upfront capital commitments and obligations. MLM is a powerful model (Herbalife is one example), but social selling can generate abusive aggressiveness, poor customer relationships and low return-purchase rates. The concierge model is instead formulated as an expert/amateur relationship. A concierge-turned-salesperson model isn’t a fit for all verticals, and it also can’t be as well-leveraged by hybrid AI assistants. But it does solve some of the scalability concerns that most consumer businesses experience once traditional digital channels (Facebook, Google) begin underperforming. However, investors who properly understood GoPro saw it primarily as a highly engaged community of sports enthusiasts, something that is very hard for competitors to replicate. And yet, at least on a macro scale, the presumed value is very much in doubt. According to the same report, results are similarly disappointing at Twitter and Facebook. One-time startup darling, community-leveraged shopping portal Polyvore was acquired by Yahoo in 2015 for $200 million — a healthy price to be sure, but certainly lower than once hoped. Even GoPro, noted by Dixon as a community outlier, has lost nearly 75 percent of its enterprise value in the public markets over the past 12 months. True, it trades at a premium to commodity manufacturers, but it appears its community purchasing may not be as strong as once imagined. Transactional communities with more vertical specificity outperform bare-bones e-commerce. Nevertheless, transactional communities with more vertical specificity (such as Soylent) outperform bare-bones e-commerce. And it is clearly the very early innings in Pinterest and Twitter’s efforts to sell products directly through their platforms. 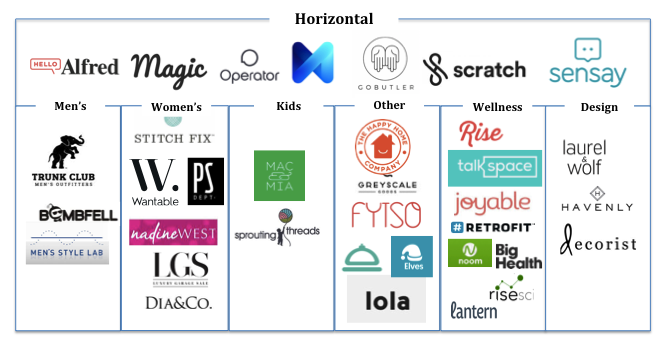 Don’t be surprised to see the larger horizontal community players continue to struggle, and ultimately acquire companies in the concierge space in order to boost their conversions, order sizes and frequency. The upside of human-driven assistant/concierge services is that in most scenarios, they add value to an end-user experience. The downside is that they add material costs to a company’s P&L. The company employs (W2s) any number of wellness professionals who are expected to interface with a given quota of customers. Although this model enables the wellness app to maintain their gross margins, it cuts deeply into their contribution margins because of the additional labor expense. The other option is to view the wellness professionals more like marketplace suppliers, and connect them to customers on a 1:1 basis, while paying them a percentage of every transaction (say 70 percent). Though this does have the effect of removing the wellness professional costs from the G&A line, it also changes the nature of the business — from a 90 percent margin software business to a marketplace model with a 30 percent take-rate. Given those two options, it’s clear why a hybrid AI/machine learning model is the holy grail for several verticals — replicating the level of personalized service while minimizing overhead labor costs and maintaining extraordinary software-level gross margins. That said, it is still unclear if hybrid AI assistants can provide an end-user experience powerful enough to materially affect purchasing, conversion and frequency. For the time being, within the fully human-powered services, the winning business models will be ones that can hire relatively inexpensive, untrained people who can then be empowered via software or leveraged workflows to deliver a meaningfully improved end-user experience. This has the added benefit of yielding greater supply/expert-side scalability, in that the pool of potential concierges is far larger (if performance does not require deep expertise) and the level of consistency, even across expertise levels, will be more stable. Startups trying to wedge into the market using a high level of service need to be highly cognizant of, and focused on, controlling costs. Especially as the investor market continues transitioning away from high cash burn models, obsessive attention on how to deliver a high-quality experience, deepening long-term scalability and leveraging lower-cost labor will yield many compelling outcomes. Disclosure: Chicago Ventures is an investor in LGS, Mac&Mia, Rise Science, Retrofit and Havenly.